British student Will Armstrong lost his ID on a night out. 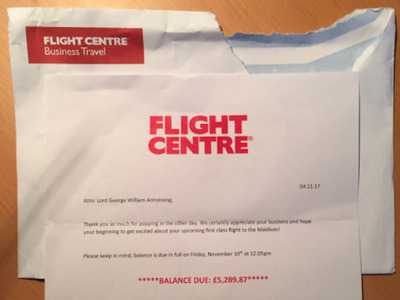 A few days later he received an itinerary the Flight Centre travel agent for a first-class trip to the Maldives. The letter was part of a prank by the company, who had found his ID. 26-year-old Will Armstrong — a student from Cheltenham, England — lost his ID on a night out. A few days later, he received an itinerary for a first class trip to the Maldives — and was told he had to pay them £5,289.87 ($A9,100) just six days later. It included an itinerary for a trip to the Maldives in early December, flying first class with Etihad Airways. “Please keep in mind, balance in due on Friday, November 10th at 12:05 p.m.,” the letter went on. However, the letter was all part of a prank by his local Flight Centre travel agent, who had found his driving licence outside their shop — and found a unique way of returning it. Armstrong visited the store to thank Steve, the man who found his licence and returned it to him with the cruel-but-funny prank.